Gemstone : Genuine Turquoise necklace. -- More About The necklace --. Note . Handmade Chunky Sterling Silver clear Rock Crystal Quartz gemstone necklace. 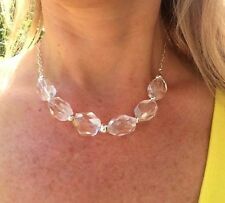 Handmade stunning clear faceted Rock Crystal Quartz gemstone necklace. on an oval link solid Sterling Silver link Chain, finished with a Sterling Silver clasp ending in a Rock Quartz bead. 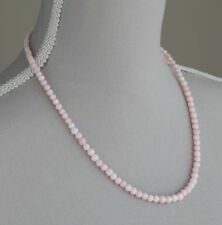 THIS IS A STUNNING PALE PINK OPAL NECKLACE. THE LENGTH OF THE NECKLACE IS APPROX 20". 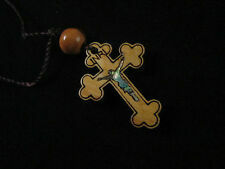 I CAN ALTER THE SIZE OF THE NECKLACE FOR YOU IF REQUIRED. Necklace Lazuli 20" 635ct 12mm round Bead Natural Untreated E694/5. Lapis Lazuli Natural Untreated Earth Mined. MULTI COLOURED BERYL FACETED RONDELLS NECKLACE. THIS IS A STUNNING NECKLACE USING 55 CTS OF BERYL RONDELLS. 925 STERLING SILVER BOLT RING CLASP AT BACK OF NECKLACE. WITH 925 STERLING SILVER BEADS. YOUR NECKLACE WILL BE WRAPPED IN TISSUE AND SENT IN AN ORGANZA BAG. The Ruby's are a lovely "Pinkish Red" a little darker than photo's show. Real Earth Mined 1 Strand 20" Necklace. Oval Shape Approx 687ct Beads Approx 16-7 mm. Overall Length End To End 21". A multi semi precious gemstones necklace which has 9ct gold fittings with all the stones having been tumbled so they are smooth and bright with the array of colours it will go with almost any colour outfit. GORGEOUS TURQUOISE COLOURED HOWLITE NECKLACE. WITH SILVER COLOURED SEED BEADS BETWEEN THE 6MM HOWLITE STONES. SILVER PLATED TOGGLE CLASP AT THE BACK OF THE NECKLACE THAT COULD BE WORN AT THE FRONT. PERIDOT IS AUGUST'S BIRTHSTONE. GREEN PERIDOT NECKLACE WITH WHITE SHELL PENDANT. THIS IS A STUNNING NECKLACE USING 60 CTS OF GREEN PERIDOT SMALL NUGGETS. 925 STERLING SILVER CLASP AT BACK OF NECKLACE. Pink Morganite Crystal Gemstone Statement Necklace "Sweet Rose"
Morganite evokes a sense of Peace, Joy and Inner Strength. It fastens with a Silver Toggle Clasp. "Sweet Rose". THIS IS A STUNNING SKY BLUE OPAL & GREEN NECKLACE. THE LENGTH OF THE NECKLACE IS APPROX 20". 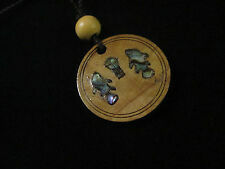 I CAN ALTER THE SIZE OF THE NECKLACE FOR YOU IF REQUIRED. WITH STERLING SILVER CLASP AT THE BACK. Necklace Emerald,Ruby and Sapphire 20" 956ct Round faceted 13-19mm Beads E697. 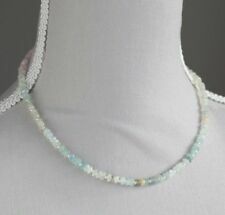 Strand 956ct 13-19mm faceted Bead 20-40" Necklace. Wear it Long or Wear it Short. Style: Strand/StringLength: 20 - 21.99"
Featuring a detailed lotus flower. a lovely row of glossy black onyx beads (tested). The Jewellery Vault. Jewellery box is for display purposes only. marked sterling. Metal: Sterling SilverStyle: Strand/StringLength: 20 - 21.99"
BLACK AGATE NECKLACE. SILVER PLATED TOGGLE CLASP AT THE BACK OF THE NECKLACE. I CAN ADJUST THE SIZE OF THE NECKLACE IF REQUIRED. ITEM WILL BE WRAPPED IN TISSUE AND SENT IN A PADDED ENVELOPE. Multi Untreated Gemstone 20" Necklace. Rose Quartz & Pink Jade Crystal Gemstone Statement Necklace "Summer Rose"
"Autumn Rose". Rose Quartz is known as the ‘Love Stone’ and is said to stimulate the Heart Chakra whilst Jade is a Stone of Serenity and Purity. It fastens with a Silver Toggle Clasp. The Jewellery Channel Green Aventurine Necklace with authenticity certificate. Clasp: Large 13mm, very strong Rhodium plated 925 Sterling Silver magnetic clasp. Very easy fasten. A fabulous chunky necklace featuring beautiful green gemstones with a kind of inner glow, really gorgeous gems. 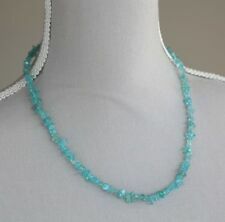 Turquoise nugget Gemstone 20" Necklace. Real Earth Mined 1 Strand 20" Necklace. The Ruby's are "Dark Red" not Pale as shown in the photo's. Overall Length End To End 21". GREEN COLOURED TSAVORITE GARNET NECKLACE. JANUARY'S BIRTHSTONE. THIS IS A STUNNING NECKLACE USING 50CTS OF GARNET NUGGETS. GARNET FROM AFRICA. 925 STERLING SILVER CLASP & BEADS AT BACK OF NECKLACE. I CAN ALTER THE LENGTH OF THIS NECKLACE IF REQUIRED. Oval Carved Approx 472ct Beads Approx 17-21 mm. Real Earth Mined 1 Strand 20" Necklace. The Ruby's are "Dark Red" not Pale as shown in the photo's. Overall Length End To End 21". WITH GOLD COLOURED SEED BEADS BETWEEN THE 8MM TIGER'S EYE STONES. GOLD PLATED FANCY TOGGLE CLASP AT THE BACK OF THE NECKLACE THAT COULD BE WORN AT THE FRONT. GORGEOUS TIGER'S EYE ROUNDS NECKLACE. Oval Carved Approx 540ct Beads Approx 18-20 mm. Real Earth Mined 1 Strand 20" Necklace. The Ruby's are "Dark Red" not Pale as shown in the photo's. 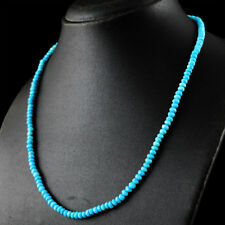 Necklace Lazuli 20" 687ct 28-35mm Bead Natural Untreated E308. Lapis Lazuli Natural Untreated Earth Mined. 28-35 mm Bead String 20" Necklace. 14MM LAPIS LAZULI BEAD NECKLACE. 20" LENGTH. PREMIUM GRADE. PREMIUM GRADE LAPIS LAZULI. LARGE 14MM ROUND POLISHED BEADS. 20" LENGTH SINGLE STRAND. BOLT RING CLASP. 150 GRM WEIGHT. MOOKAITE CHUNKY NUGGET NECKLACE ~ GOLD PLATED HEART CLASP 21"
CHUNKY MOOKITE NUGGET NECKLACE. GOLD PLATED HEART SHAPED CLASP AT BACK OF NECKLACE & CAN BE WORN AT THE FRONT ALSO. THIS IS A STUNNING NECKLACE USING 266CTS OF LARGE NUGGETS. YOUR NECKLACE WILL BE WRAPPED IN TISSUE AND SENT IN A PADDED ENVELOPE. BLUE / GREEN MOTHER OF PEARL ROUNDS. THIS IS A GORGEOUS MAINLY CONSISTING OF CREAM SHELL ROUNDS. THE EARRINGS MADE WITH CREAM & BLUE SHELL. HAND CRAFTED NECKLACE. SILVER PLATED TOGGLE CLASP AT THE BACK OF THE NECKLACE. Round Faceted Shape Approx 390Cts Beads Approx 6 mm. Real Earth Mined 3 Strand 20" Necklace. The Ruby's are "Dark Red" not Pale as shown in the photo's. Overall Length End To End 21". MYSTIC COATED CRACKLED QUARTZ NECKLACE WITH 925 STERLING SILVER CLASP 20"
THIS IS A STUNNING MYSTIC COATED CRACKLED QUARTZ NUGGET NECKLACE. NECKLACE WITH STERLING SILVER CLASP 20" IN LENGTH. I CAN ALTER THE SIZE OF THE NECKLACE IF REQUIRED. ITEM WILL BE WRAPPED IN TISSUE AND SENT IN A PADDED ENVELOPE. Dusky pink shell pearl necklace. Gold plated clasp and findings. Necklace Tourmaline Watermelon Genuine 371ct 3 Line untreated Bead E318. FUCHSIA PINK QUARTZ NECKLACE WITH SILVER PLATED CLAP 21" IN LENGTH. 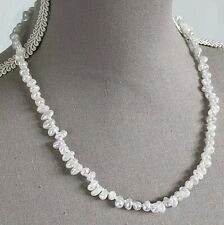 GORGEOUS QUARTZ NECKLACE USING SMALL NUGGETS. FANTASTIC VIBRANT NECKLACE. Necklace Ruby 20" Real Earth Mined Big 19 x 10 mm Pear Bead E300. 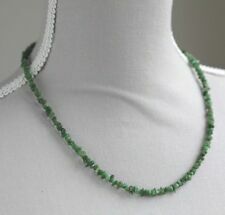 Real Earth Mined 280 ct Bead Approx 19x10 mm 20" of bead Necklace. Wear It Long Or Wear It Short. 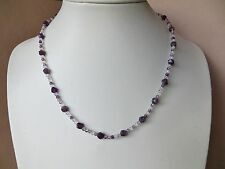 Necklace Spinel 20" 185ct Natural Untreated Round 6mm Bead E313. 1 Line 20" 185ct Round 6mm Bead String Necklace. Smoky Quartz 553.50ct Bead 5.50mm. Lower 3 Line Necklace. 21" Necklace. FINE AAA GRADED NATURAL LAPIS LAZULI. of large Rich Blue Graded Lapis beads. Photos are not to scale, but have shown Necklace against hand as a guide to size. LARGE 18 MM ROUND INDIVIDUALLY KNOTTED BEADS. The rainbow flouride are 8mm and 6mm. Quality Silver plated on brass components. CITRINE LARGE NUGGET, GREY BOTSWANA AGATE & SMOKEY QUARTZ NECKLACE~ 20"
& GREY BOTSWANA AGATE SMALL NUGGETS. WITH SMOKEY QUARTZ ROUNDS. THIS GORGEOUS NECKLACE IS MAINLY CONSISTS OF CITRINE LARGE NUGGETS. HAND CRAFTED NECKLACE. THIS NECKLACE IS APPROX 20" IN LENGTH. Real Earth Mined 1 Strand 20" Necklace. The Ruby's are "Dark Red" not Pale as shown in the photo's. Oval Approx 692ct Beads Approx 18-22 mm. Overall Length End To End 21". RED AGATE NECKLACE & EARRING SET NECKLACE LENGTH 20"
GORGEOUS RED AGATE NECKLACE WITH WARM COPPER / BRONZE TONES. NECKLACE WITH SILVER PLATED CLASP 20" IN LENGTH. WITH MATCHING DROP EARRINGS. BEAUTIFUL SILVER NECKLACE WITH PINK TOPAZ & WHITE CZ. SKY BLUE APATITE NECKLACE ~ 925 STERLING SILVER 20"
JFTS, Fw Pearl, Red, Carnelian, Bead, Necklace, Dino Bone, Pendant, Sterling,20"
Lilac Alexandrite Crystal Gemstone Beaded Statement Necklace "Mystic Lilac"
Pink Morganite & Rose Quartz Gemstone Statement Necklace "Rose Cascade"